Avast, me hearties! Plunder the kitchen and grab some grog (or root beer)--'tis International Talk Like a Pirate Day! T' celebrate, I be butchering the conventions o' pirate lingo an' introducin' the greatest (and only) comedic pirate-themed adventure game series ever to set sail--Monkey Island. So, grab yer grog, cinch up your corset, keel a yardarm, and... uh... plunder a bilge rat? Sorry. I'm celebrating Talk Like a Moron Pirate Day. 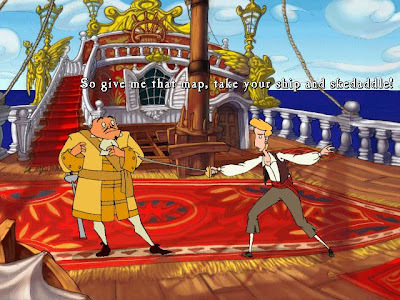 Anypegleg, the Monkey Island games feature everything you'd expect from a pirate game--adventure on the high seas, voodoo magic, sea chanteys (yes, I spelled "chanteys" right, thank you), swordfighting, and, most importantly, pirates. 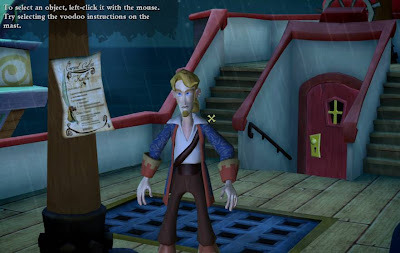 The series is primarily a computer game series, but a few Monkey Island games have found their way to consoles such as the PlayStation 2 and the Wii. The protagonist of these games is Guybrush Threepwood, a mighty pirate. A mighty clueless pirate, that is. Whether trying to prove himself worthy of being a pirate, fighting his nemesis, the dread pirate LeChuck, or trying to woo/rescue the love of his life, Elaine Marley, Guybrush gets into all sorts of trouble, often of his own making. 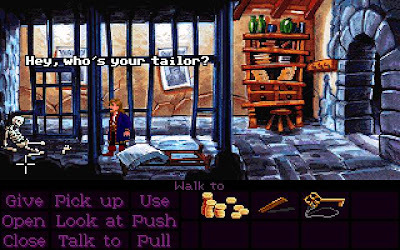 It's up to you to get Guybrush out of trouble and save the day, but you'll need to be creative and clever (and possibly use a walkthrough). As point-and-click adventure game series, Monkey Island features oodles of puzzles: you'll need to escape from a sealed bank vault, navigate through a baffling forest maze, assemble a voodoo doll using improvised ingredients, and best your enemies in combat with your sharp sword and sharper wit. "How appropriate. You fight like a cow." 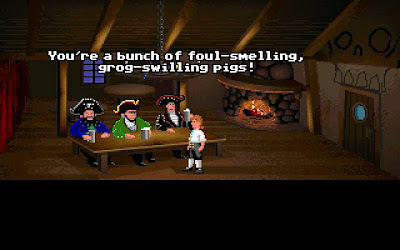 Most of the insults and responses are highly amusing; the Monkey Island games in general are known for their humor, and the dialogue is traditionally where the comedy comes through the strongest. There are plenty of sight gags and absurd situations, but the jokes and one-liners alone are worth the price of admission. 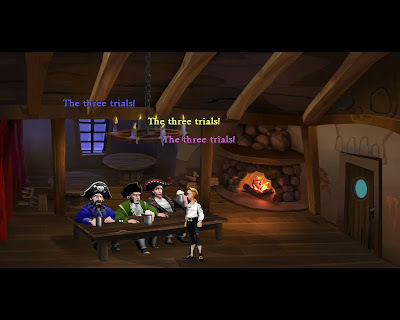 Each game in the series has a distinct feel in terms of both style and content--unlike most other series, Monkey Island does a good job of making each game fresh and unique, and anything that's recycled from one game to the next is almost always done for a laugh or for the sake of the plot. The Monkey Island games are also very forgiving: It is impossible to die (well, unless you really go out of your way to bump off Guybrush, but there's virtually no chance of doing that unintentionally) and you can't accidentally do or say anything that will prevent you from beating the game. SoMI is an adventure game classic, sort of like the Monty Python and the Holy Grail of video games. A solid plot, entertaining characters, clever puzzles with funny solutions, and a slew of memorable quotes make this a game a must-play for anyone remotely interested in adventure games. Guybrush Threepwood wants to be a pirate, so he attempts to prove his worth by undertaking three trials given to him by some important-looking pirates who clearly know what it takes to become a pirate. Guybrush soon falls in love with a woman, Governor Elaine Marley, but there's one big problem: the ruthless ghost pirate LeChuck has already vowed to win her hand in marriage, or to take it by force. 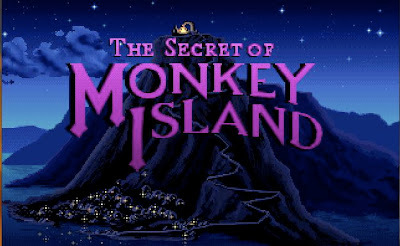 Before long, LeChuck kidnaps Elaine and it's up to Guybrush to find a ship, assemble a crew, and sail off to a place called Monkey Island to rescue Elaine. Some things to look forward to: Insult Swordfighting, safecracking, treasure hunting, breaking someone out of prison, escaping from a village of funny cannibals (not scary cannibals, mind you), fun with a rubber chicken, and possibly sinking your own ship if you're not careful with your aim (or if you're too careful... bwahaha!). 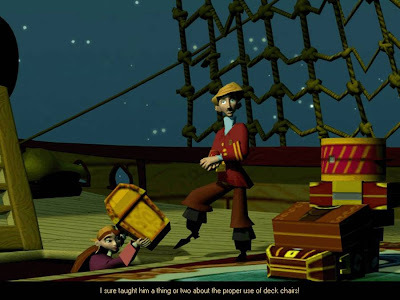 SoMI was given updated graphics and audio for The Secret of Monkey Island: Special Edition, which also features full voice acting and the ability to switch back and forth between the original and updated look and sounds. MI2 is generally held in high regard by the gaming community and is just as strong as the original, if not stronger in some respects. However, MI2 isn't as appealing to me as the other games; many of the puzzles feel more like annoying obstacles than fun challenges, the theme and setting are generally darker than in the other games, and while MI2 is certainly funny, the jokes and one-liners from MI2 haven't stood out the way the humor from the other games has. Guybrush has grown a beard (the mark of a true pirate!) and is now after the greatest treasure of them all--the treasure of Big Whoop. 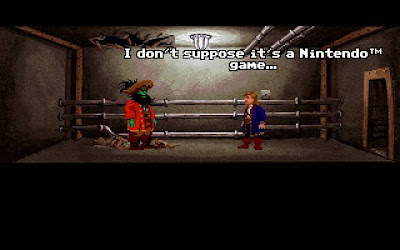 Guybrush scours the Tri-Island Area to reconstruct the map that will take him to the treasure; this is even more imporant to Guybrush than ever when the treasure of Big Whoop is revealed to be the only thing that can stop LeChuck, who has returned as a zombie (and Guybrush is to blame). Some things to look forward to: a mysterious voodoo hut in a creepy swamp, a graveyard with some very silly tombstones, a spitting contest, an eerie shipwreck at the bottom of the ocean, a deadly and ridiculous Rube Goldberg machine, a fast-talking used coffin salesman, and a monocled cartographer named Wally B. Feed. CMI is a well-loved game and often cited as a fan favorite. Actually, it's usually the case that Monkey Island fans will pick one of the first three games as their favorite, as they're all excellent adventure games with good plots and great humor. CoMI sports highly stylized and somewhat cartoony graphics as well as full voice acting from a dynamite cast, and while I prefer the graphical style of the other games, I feel the voice acting is what really makes this game a success. The story is sillier than in the previous two games, and some of the puzzles are pretty out there, but overall it's a very fun experience. Guybrush rescues Elaine once again from the clutches of LeChuck, who (like any good bad guy) just keeps coming back. Guybrush finally declares his love for Elaine and proposes to her with a ring he looted from the treasure hold of LeChuck's ship... except he doesn't realize the ring is cursed. So Elaine turns into a statue. And is promptly stolen by thieves. Kinda puts a damper on the whole engagement thing. Guybrush must assemble a crew once again and get his hands on the map that will take him to the lost island that holds the secrets of lifting the curse. Some things to look forward to: Ship-to-ship combat, Insult Swordfighting on the high seas, curing a bartender's hangover, scaring a fear-resistant gravedigger, sneaking into a hoity-toity beach club, a caber tossing contest, and singing barbers. Though EMI suffers from unintuitive controls and a few outrageously frustrating and tedious puzzles, and though it occasionally loses the feeling of being a Monkey Island game, I still like EMI for its great voice cast, humor, fun characters, diverse and perfectly fitting music, semi-cartoony 3-D graphical style, and some of its interesting locations. EMI might be a fairly weak Monkey Island game, but it's still a pretty decent adventure game. Guybrush and Elaine are now married and live together in Elaine's gubernatorial mansion, but a rival politician named Charles L. Charles has come to town, and Elaine is in no position to run against him because she was declared dead in her long absence from office. Guybrush's adventure begins with working out a plan to clear things up, but it's not long before Guybrush gets involved in a race with a greedy Australian for a powerful voodoo talisman known as the Ultimate Insult, which could be used to take over the entire Caribbean if it falls into the wrong hands! Some things to look forward to: Insult Armwrestling, blowing up a catapult, riding down a river of lava, amassing a small collection of random prostheses, a diving competition, lawyers, and lots of monkeys. TMI is a departure from the format of the previous four Monkey Island games in that it's episodic, having been released one part at a time over the course of several months. Each of the five episodes is a self-contained adventure that makes up part of a larger story. 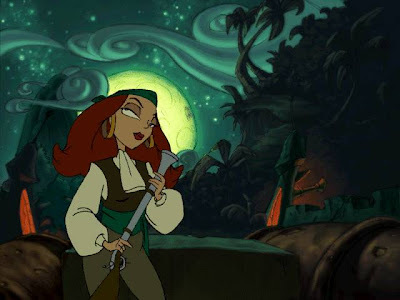 With a few exceptions, the cast of CMI is back to voice their characters, and there are throwbacks to all the previous Monkey Island games (though it's obvious the writers went out of their way to avoid talking about Escape from Monkey Island). LeChuck is back this time with yet another crazy scheme to conquer the Caribbean, except when Guybrush's attempt to interfere doesn't go entirely according to plan, a horrible pox is released upon the Carribean, and it's up to Guybrush to clean things up before the pox spreads too far. TMI is the most-plot intensive game in the series, and it raises some very interesting questions about the nature of the main characters and the relationships between them. The first two episodes are similar to the Monkey Island you've come to know and love, but the third episode goes into territory that's more disgusting, mature, and immature than usual. The last two episodes are darker than anything in MI2--if it weren't for Guybrush's tastefully humorous dialogue in the face of such seriousness, these two episodes would feel like a different series entirely, or at least a very grim and edgy Monkey Island reboot. Maybe it works for you, maybe it doesn't. Some things to look forward to: Lots of voodoo, the unlikeliest puzzle-solving duo in Monkey Island history, Guybrush defending himself in court, making utterly absurd faces at people, MANATEES!, and clever takes on some of Monkey Island's most iconic and beloved puzzles.